What’s the Best HDR Software? Let’s take a look at the best HDR software that you can use to produce high contrast and high dynamic range images. High Dynamic Range or HDR is a popular effect in photography. It involves capturing a larger range of light stops from the darkest black to the brightest white. This happens by combining two or more images of the same composition, each of which entails a different exposure setting relevant for a particular section of the composition. In other words, an HDR image represents a higher dynamic range than you would otherwise get with a single exposure. Which in turn means you get more details out of both the highlights and shadow areas of your images. Most modern cameras come with software that allows combining of two or more images and thereby creating a single image with a higher dynamic range. Even smartphones and of course point & shoot systems come with this feature. However, the problem with these systems is that there is hardly any control over what the final output would be like. The best solution is to shoot with a DSLR or an interchangeable lens camera. At least any camera that allows you to shoot in RAW and use a feature known as Auto Exposure Bracketing. When you have the different exposures you need you can then combine them together and post-process them to produce the results you need. Speaking of HDR software, there are a few good choices in the market. Photomatix Pro immediately comes to mind. So does Nik’s HDR Efex Pro. Aurora HDR is another great choice. 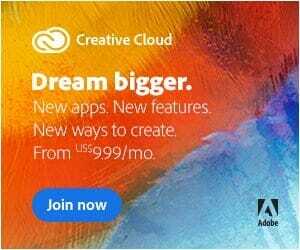 Of course in between all these Adobe’s Creative Cloud involving Lightroom and Photoshop are a software duo that has always remained a market leaders. Photomatix Pro is a product developed by UK Based software company HDRSoft. It is probably the oldest dedicated HDR software that’s been around. Many photographers would vouch that they have used Photomatix as their first ever HDR software. Recently they came up with version 6 of their product. Already, Photomatix Pro garners a sizeable following when it comes to editing and developing HDR imagery. Version 6 of the product releases a number of exciting new features. One of the problems of overdoing the HDR effect is that the result looks far too obvious. There is literally very few blacks and whites which tend to suggest that the software has been stretched to produce an unrealistic effect. One of the tools inside Photomatix Pro that can be held responsible for this is Details Enhancer. Details Enhancer can sometimes create those really weird over the top results that go against the whole concept of a contrasting yet realistic landscape photo. For editing landscapes choose the Tone Balancer tool inside Photomatix Pro. This produces the sort of results that are realistic and is more likeable. Of course under each of the tools you can adjust the sliders to produce a more tasteful result. Just as with everything else in photography HDR effects too depend on the personal taste and preferences of a photographer. So, overdoing the effects can have disastrous effects. One of the latest features of the software is the ability to blend in a hitherto unedited frame with an HDR image. This basically gives one more option to the photographers to produce a slightly more contrasting result. This can, however, be adjusted. You can change the opacity to ensure a result more to your taste. This prevents the overdone effect. Still on the new features of the software, Photomatix 6 has a new Brush tool feature. This brush tool allows you to make adjustments to specific areas of a photo. The Brush tool is available under Color Settings. So, saturation, temperature and brightness whatever changes you make to an image those don’t have to be global. The brush tool works for even the blending tool. Meaning, you can brush over the areas where you don’t want the blending effect to take place. A new Detect Edges tool does a great job of knowing where the edges of the photos are and that takes care of any unintended application of the brush tool. While most HDR software would require that you shoot from a fixed platform, such as a tripod so that the alignments are uniform across all the images, Photomatix do not have any such requirements. Another tool that may be useful, depending on whether you are coming from Lightroom or Photoshop or using Photomatix Pro as a standalone product, is the Straighten tool. The Straighten tool allows you to straighten things like a straight line or the horizon line or a straight building which may appear curved due to imperfections in the lens. If you use any other standalone software you don’t need this tool. Ideally, if you are using Lightroom or Photoshop, then these tools are more than enough for you to take care of these little adjustments. Photomatix HDR Software Sample Images – see more sample images. Finally, a word on the User Assisted Ghost Removal tool. If you have dabbled a bit in HDR photography you would no doubt know that taking multiple images in an urban environment will definitely capture one of more moving elements in the frames. A person or a car or a bird. This creates a ‘smearing effect’ in the final image which is known as Ghosting (not the same as in lens Ghosting). All good HDR software do come with a built-in ghost removal function. But they don’t tend to do a great job because they are not psychic. The User Assisted Ghost Removal tool goes a step ahead of the built-in Ghost removal tool. Using this feature you can mark out the area that you need to be corrected. You can even select the frame that you wish to use. 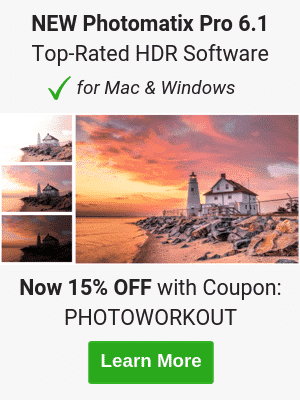 We have reached out to the team behind Photomatix (HDRSoft), and they have agreed to give PhotoWorkout.com readers 15% off on the regular list price (just use the coupon code “PHOTOWORKOUT” at checkout). Aurora HDR is yet another HDR software, which some photographers such as Serge Ramelli claims to be the best HDR software in the planet. I personally feel that is a bit over-exaggerated. The software is developed as a joint collaboration between Trey Ratcliff from StuckinCustoms and MacPhun (now called Skylum) a company that produces a lot of utility image editing software. Let’s take a look at some of the features of Aurora HDR software. One thing though, this software is only available for the Mac. A windows version is in the works (update: Aurora 2018 is now available, incl. the Windows version)as the company claims. You can subscribe to updates about the launch of the windows version. One of the most powerful tools available in the software is the HDR Tone Mapping. The most instantly gratifying application is the HDR Look. This is the slider that increases or decreases the HDR effect. Overdo this and you will end up with results that are completely over the top. There are a number of options to add custom textures, bracketing the HDR mode as well as adding back some of the original image into the frame. Just like Photomatix Pro, there is an option to selectively include or exclude areas that will have the effects of these adjustments. This selective adjustment using creative adjustment layers is what makes Aurora HDR one of the best HDR software in the business. There is one area where Aurora HDR has a major advantage over Photomatix Pro in terms of how you can open RAW files. With Aurora HDR you can import the RAW files directly into the software or export them through Lightroom with or without the changes you have made quite easily. With Photomatix Pro, however, if you wish to open RAW files you will have to find them on your hard drive and then open them directly in Photomatix Pro by going around Lightroom. 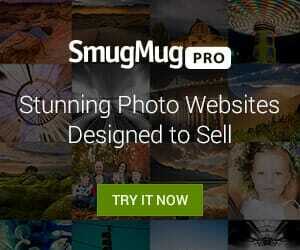 There is a Photomatix Pro plugin for Lightroom. However, you can only export TIFF files. The same goes for Photoshop. Both this software save any change information in separate sidecar file and Photomatix Pro does not have access to that file. Additionally, after you are done with the adjustments in Photomatix Pro you will have to reimport the finished the photo back to Lightroom library. One more aspect where Aurora HDR wins is the interface. Definitely, with the new 2017 interface things have become a lot more responsive and intuitive. Comparatively, the Photomatix Pro interface is cumbersome and not as responsive. If you would like to buy Aurora HDR, then PhotoWorkout.com has a special coupon code for our readers: enter “PHOTOWORKOUT” at the time of checkout to get $10 off. 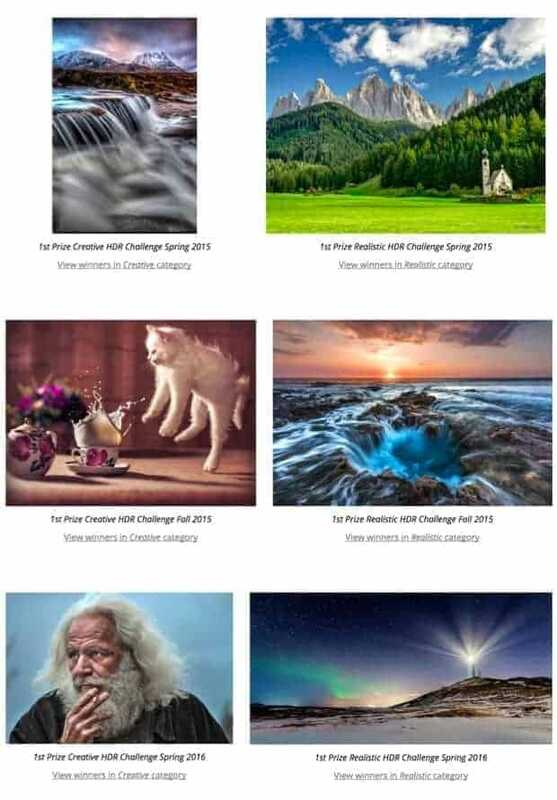 Nik has always been a company that produced fantastic filters and presets for Photoshop. 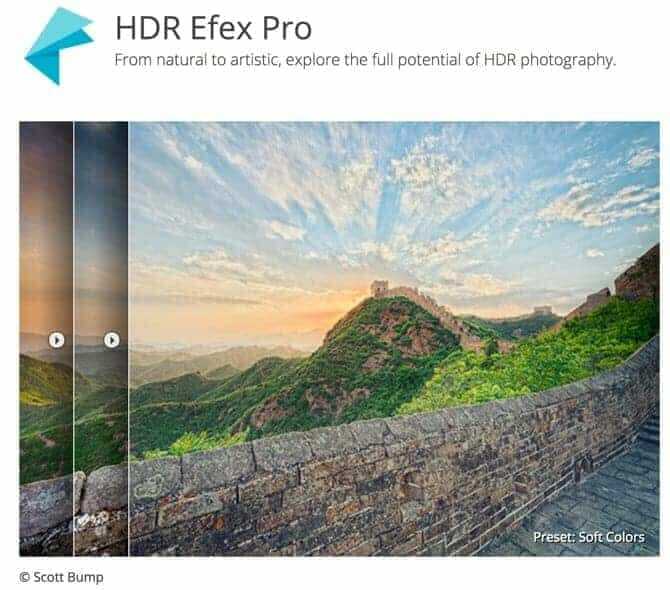 They have also come up with the new HDR software – HDR Efex Pro. Still quite nascent in terms of existence, this new software brings a third perspective to the growing HDR market. The thing about HDR Efex Pro is that the software is built to function as a plugin for your choice of photo editing application. Thus, when compared with something like Photomatix Pro, you have a different workflow. Some people may like the convenience, of not having to move back and forth between two software. Others might not like it. This is a subjective thing and I am not going to comment on that. But personally, when using both software I felt that HDR Efex Pro missed the ability to add the active/open files to HDR directly, or have some sort of a workflow to open files directly into the application and from there on import it back to Lightroom or other application of choice. All of the HDR software that we have discussed thus far comes with presets. Presets make it extremely easy for photographers to quickly give certain effects. A thing that I like about the HDR Efex Pro software is that it groups the presets into meaningful image types. So, you have groups like Landscape, Architecture and Artistic. The grouping system followed by Photomatix Pro is, to say the least, confusing. ✔ Tip: Want to print your HDR Photos on a Canvas? Then take a look at the best canvas prints, like CanvasPop.com. Nik’s HDR Efex Pro also has a simpler labeling mechanism when compared to some of the other HDR software that we have seen. It appears that they understand that not everyone who wishes to use an HDR software has a deep understanding of photographic terminologies. So, labels like Contrast, Blacks, Whites, Exposure etc. are easy to understand and work with. This would probably sound similar to you, having seen the other two HDR software. This feature basically allows you to make localized adjustment to contrast, exposure, saturation and those sort of things. Again, whether or not you would want your HDR software to take care of these changes depends on your preferences and your workflow. Even before you start looking for an HDR software to take care of your HDR imagery, there are some options that you can try locally. That is if you have Lightroom or Photoshop installed on your computer. Lightroom comes with a built-in HDR Photo Merge feature. This feature allows you to merge two or more images within Lightroom to create an HDR image. There are a few blending options available too. One is Auto Align and the other Auto Tone. The first one is useful for the purpose of aligning images. That is required when the images are shot hand-held. If you have shot the images using a tripod then you don’t need this to be checked. The second feature produces a decent merging job for the images. Photo Merge, as I had mentioned before, does a ‘decent’ job of merging the images and producing a good HDR image. It is simple to use and there is not much to play around with. To some extent that is a good thing. Why? 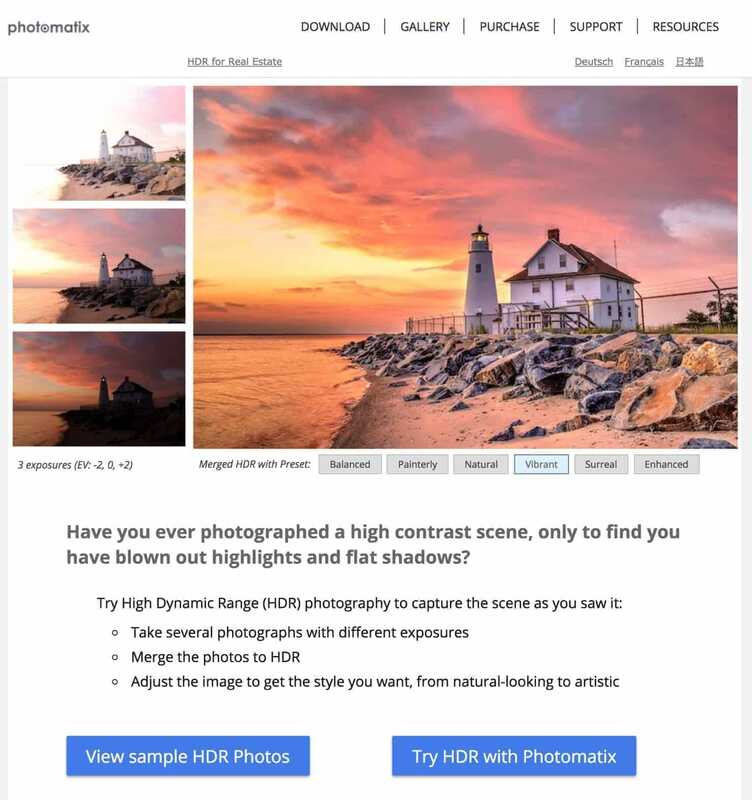 Because you have a quick and easy way of creating HDR images. You don’t need to go too deep into any settings. Just like any other HDR software, Adobe HDR Merge also has a deghosting mechanism in place. This technique has four settings in Adobe HDR Merge: None, Low, Medium, High. Now for a useful tip when using this technique in Adobe HDR Merge: You should turn on Deghost Overlay. This will give you a preview so that you can be sure of the extent that this will affect your image. I have found this feature to be best used in the “Low setting”. We hoped you like our comparison post about these top 4 HDR software applications. Thanks for this! Been thinking about adding a little HDR to my work and this is a nice simple guide. I did not know LR had a basic choice to try this! I’ve tried Photoshop & lightroom, they’re good, but limited control, I couldn’t achieve the results what I really want, so I start trying other softwares, I tried Photomatix Pro, it’s good with extra control, but when choosing an image with complicated lighting and color tones, I wasn’t satisfied, the image was for an interior furniture, 2 different lighting sources + a window scene during early evening. I took the same 3 bracketed images then to EasyHDR, after a little adjustments, result were slightly better, then I went to Aurora HDR 2019, started the image loading, it took longer time to render, but then.. I got shocked with the result! The default merge was stunning, what a smart software! Really precise and natural output, I’m really impressed! I will try it next with outdoor landscapes and see how it goes.